Oh Christmas Tree, oh Christmas Tree! 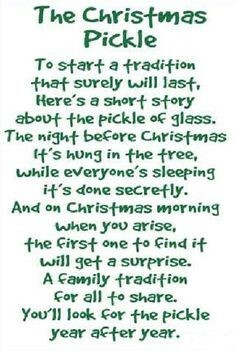 - Kauai Seascapes Nursery, Inc.
You are here: Home › Blog › Oh Christmas Tree, oh Christmas Tree! The holidays are approaching and for many of us, that means it’s time to decorate a Christmas tree! 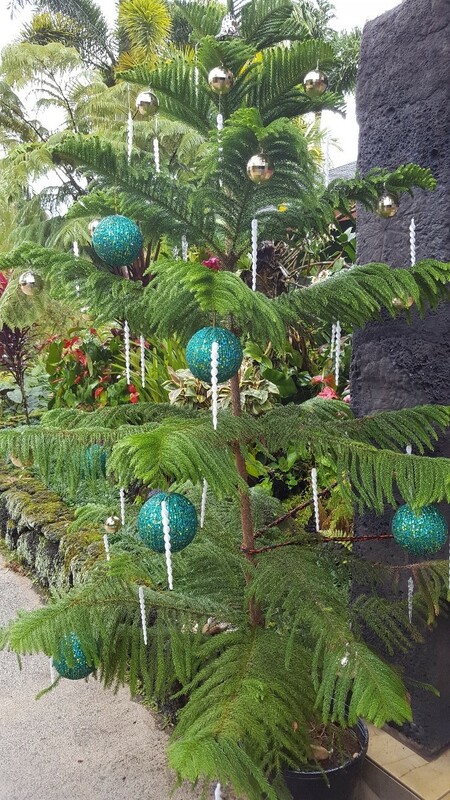 Many people head to Home Depot to pick up the regular mainland Fir tree, but did you know that there are other great options for Christmas trees, that are better for our ‘aina and even for your pocket book! 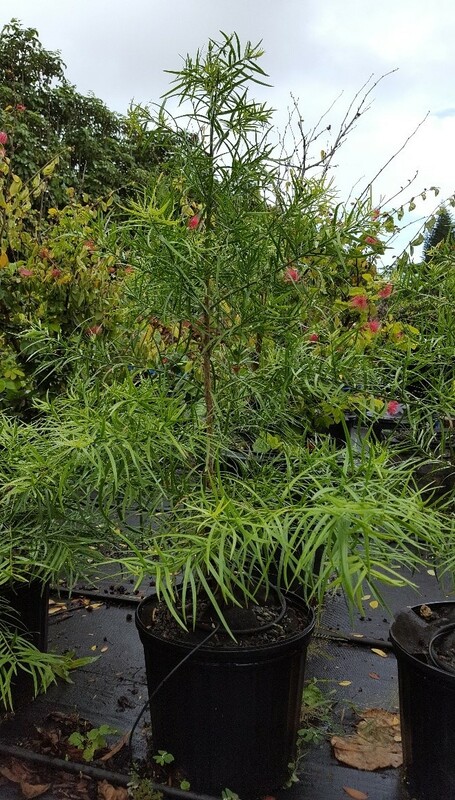 According to Kauai Invasive Species Committee, most of the Fir trees in Hawaii are shipped from the Pacific Northwest. Even though they are inspected as best as possible, the Dept. of Agriculture staff is limited and not all tag-a-long critters are caught. Unintentionally, pests and other invasive species are brought to the island in those large Christmas tree containers. 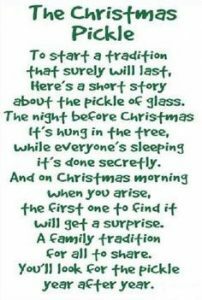 You may get more than you bargained for when unwrapping the tree at home! If you are brave enough to pass on the traditional look and embrace the tropics (or want to be more Pono this year), we have some lovely (and live!) x-mas tree impersonators for you! 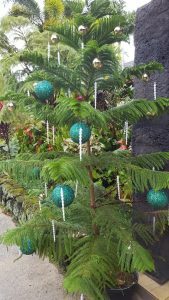 The most popular Christmas tree alternative in Hawaii is the Norfolk Pine. Also called Monkey Puzzles, they have the traditional pine needle look and smell that is adored at this time of year. 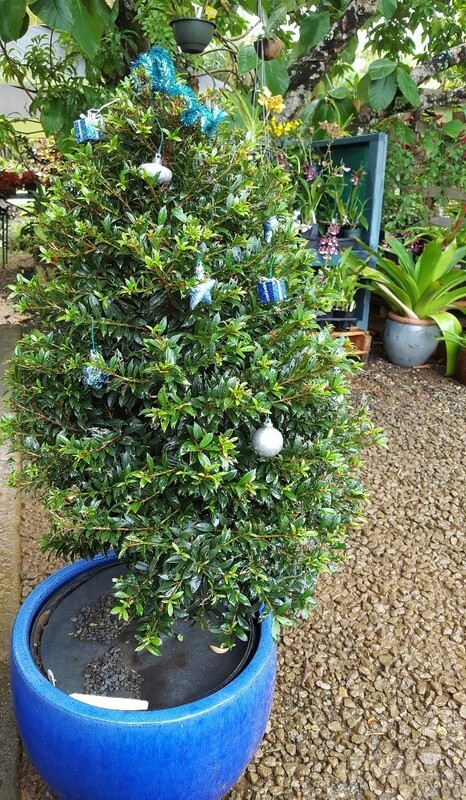 At the nursery we have live Norfolk Trees available in various sizes, from dainty and pre-decorated “Charlie Brown” 1 gallon trees to 6′ tall live potted pines. 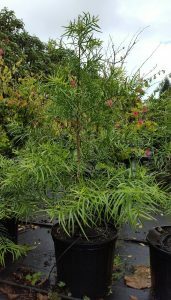 Another cute option is the Podocarpus gracilor tree. 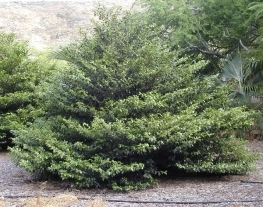 A type of conifer with many additional uses in the landscape post-Christmas; such as a hedge, ornamental or shade tree. If you’d like to go for a more unique look, check out our Syzygium (pronounce that 5 times fast…) topiary trees. 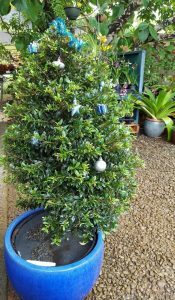 We have some nicely shaped into Christmas Tree form and also other shapes standing around 3ft tall that would make a great alternative to Fir. 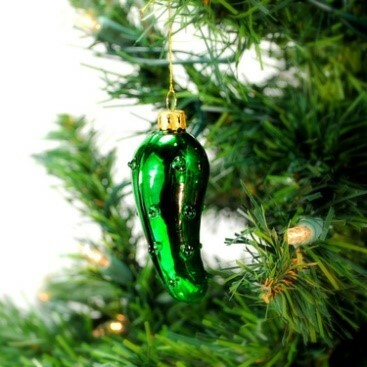 If you’re German, like I am and grew up ‘finding the pickle’ this would be a really great tree for that tradition ? Mock Orange, popular in the landscaping community already, might make an interesting option; fragrant, dark green glossy leaves and red berries make for a heart-warming look in the house. Alahe’e, also called the native mock orange is another option, and a Hawaiian native plant at that! It’s natural grown shape is very reminiscent of mainland pine trees, and it’s also has wonderfully fragrant white flowers in the spring and summer. It’s a lovely addition to your yard regardless of the season, and wouldn’t it look gorgeous decorated with Christmas lights each year! As I’ve alluded to, these tropical live Christmas tree alternatives can be repurposed after the holidays and planted into your yard. Or you could let your tree grow in the pot over summer (upsize as necessary) and reuse them for a number of year! Save money and practice pono! We have a limited supply of these great options so hurry in and grab your favorite before we’re out! Mele Kalikimaka and Hau’ole Makahiki Hou! Native Plants and Pulelehua, For All You Lepidopterists!